Super Hot – 5D Mark IV Printer Bundles for $3,149, 5D Mark III Printer Bundles for $2,099 at BuyDig ! Canon USA authorized dealer BuyDig has super hot deals on Canon EOS 5D Mark IV and 5D Mark III with printer bundles. 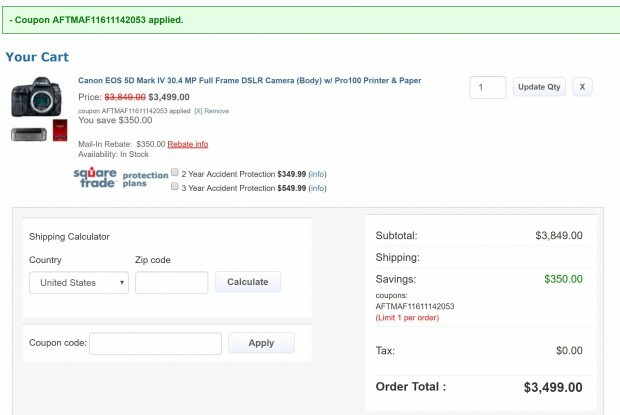 After $350 mail-in rebates and use coupon code “AFTMAF11611142053“(for 5D4) & “AFF717261161189838“(for 5D3) when checkout, 5D Mark IV printer bundle is $3,149, 5D Mark III printer bundle is $2,099, both are currently lowest price online ever. ← Hot – Sigma Art & Tamron Lenses Green Monday Deals at Adorama !